Tank setup: Peaceful planted tank with gentle water movement and plenty of open swimming space. Compatibility: Community species, should mix well with similar sized fish. Feeding: Omnivore: will take flake, which should be supplemented with live and/or frozen foods. Sexing: Breeding males are deep red or reddish brown, females are silvery with a yellowish tinge. Breeding: Spawn over fine plants. Java Moss or spawning mops can be provided. Spawning usually takes place in the morning. 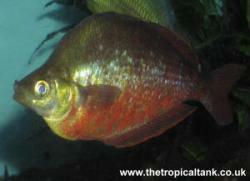 Comments: Only dominant males may show the red colouration at higher temperatures. At lower temperatures, most of the males will show the characteristic red colouration. 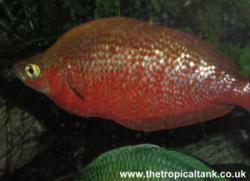 These fish are suitable for larger community tanks. They can be fairly timid and should always be kept in a shoal.